Objectives To understand the perspectives of people with severe chronic obstructive pulmonary disease (COPD) as their illness progresses, and of their informal and professional carers, to inform provision of care for people living and dying with COPD. Design Up to four serial qualitative interviews were conducted with each patient and nominated carer over 18 months. Interviews were transcribed and analysed both thematically and as narratives. Participants 21 patients, and 13 informal carers (a family member, friend, or neighbour) and 18 professional carers (a key health or social care professional) nominated by the patients. Setting Primary and secondary care in Lothian, Tayside, and Forth Valley, Scotland, during 2007-9. Results Eleven patients died during the study period. Our final dataset comprised 92 interviews (23 conducted with patient and informal carer together). Severe symptoms that caused major disruption to normal life were described, often in terms implying acceptance of the situation as a “way of life” rather than an “illness.” Patients and their informal carers adapted to and accepted the debilitating symptoms of a lifelong condition. Professional carers’ familiarity with the patients’ condition, typically over many years, and prognostic uncertainty contributed to the difficulty of recognising and actively managing end stage disease. Overall, patients told a “chaos narrative” of their illness that was indistinguishable from their life story, with no clear beginning and an unanticipated end described in terms comparable with attitudes to death in a normal elderly population. Conclusions Our findings challenge current assumptions underpinning provision of end of life care for people with COPD. The policy focus on identifying a time point for transition to palliative care has little resonance for people with COPD or their clinicians and is counter productive if it distracts from early phased introduction of supportive care. Careful assessment of possible supportive and palliative care needs should be triggered at key disease milestones along a lifetime journey with COPD, in particular after hospital admission for an exacerbation. To inform current deliberations on how best to provide care for people living and dying with COPD, we undertook an in-depth inquiry seeking to understand the end of life needs of affected patients and their informal and professional carers. Our study took place over 18 months during 2007-9. Ethical approval was obtained from the Multicentre Research Ethics Committee for Scotland (B), and governance approval was obtained from NHS Lothian, NHS Tayside, and NHS Forth Valley. Informed written consent was obtained from all patients at the beginning of the study and reviewed verbally before each interview. Informal and professional carers identified by the patient were asked independently for their consent to participate. Withdrawal of a patient’s consent terminated the interview set. If an informal or professional carer withdrew, interviews were allowed to continue with other members of the interview set. A social scientist (MK) carried out the interviews with patients and informal carers at a location of their choice, and with professional carers by phone. In-depth interviews with the patient and his or her informal carers (jointly, if preferred by the patient) were participant led, allowing people to tell their story in their own terms and at their own pace. Issues covered included the experience of living with COPD, the patient’s main concerns (whether physical, psychological, social, or spiritual), views on care and treatment, and carers’ needs and concerns (for topic guides see web appendix 1 on bmj.com). Interviews lasted between 40 and 150 minutes and were all audio recorded, with consent. Field notes were recorded after each interview. Health and social care professionals were asked about their perception of the patients’ and informal carers’ needs, available services, and barriers to the provision of care. Bereavement interviews were, where possible, conducted with both informal and professional carers. As we came to appreciate the effect of the very long disease trajectory of COPD, we used subsequent interviews specifically to explore the patients’ “story” of their condition. All transcripts were coded by MK (assisted by the study administrator), using a thematic narrative approach,23 reflecting the research questions and themes raised by the participants. We used categories informed by sociological theory on health and illness, such as Bury’s work on biographical disruption (see web appendix 2 on bmj.com).24 Frank’s typology of illness narratives was used to categorise patients’ narratives into three types: restitution, quest, or chaos (box 2).25 Restitution narratives are satisfactory stories of illness and recovery. Quest narratives tell stories of determined action and significant events that led to understanding of an illness, a search for cure, adaptation to disability, or campaigning to raise awareness or better care for the condition. By contrast, chaos narratives appear to be a disjointed series of events within which neither the narrator who is living within the story, nor the listener, can discern a clear purpose or direction. This narrative recounts a belief in a restoration to health and portrays illness as transitory. It is the easiest narrative to tell and to hear. In this narrative the patient uses the illness experience as an opportunity to embark on a personal quest; for example, to adjust to life with illness or to improve care and support for people with a particular condition. This narrative portrays illness as an opportunity to learn and improve, and is often found in celebrity accounts. This is the least heard narrative because “lived chaos” cannot be told. The story can only begin to emerge once there is an ability, however tenuous, to stand outside the chaos. Telling and hearing a chaos narrative is frustrating because it appears disjointed and without causal sequence or purpose (an anti-narrative). To bridge the (typically wide) gulf between research and practice, we convened a national multi-disciplinary end of study workshop to which we invited 27 academics, policy makers, and government representatives. This allowed us not only to share and receive critical feedback on our preliminary conclusions, but also to raise awareness of our emerging findings among those responsible for service planning and provision (see web appendix 3 on bmj.com). Extensive notes were made from recordings of the four break-out groups, in which participants were invited to reflect critically on the findings and discuss and debate the implications for policy and practice. We recruited 10 people with COPD from local “Breathe Easy” groups, a support group network run by the British Lung Foundation for people living with a lung condition and those who look after them. This lay advisory group, which was facilitated by MK, met regularly throughout the study to discuss the interview topics, the emerging findings, and the methods of disseminating the findings (see web appendix 4 on bmj.com). The comments, suggestions, and perceptions of the group were used throughout the iterative analysis process to aid interpretation. Four members of the group attended the end of study workshop. The characteristics of the 21 patients recruited to the study are given in table 1⇓. 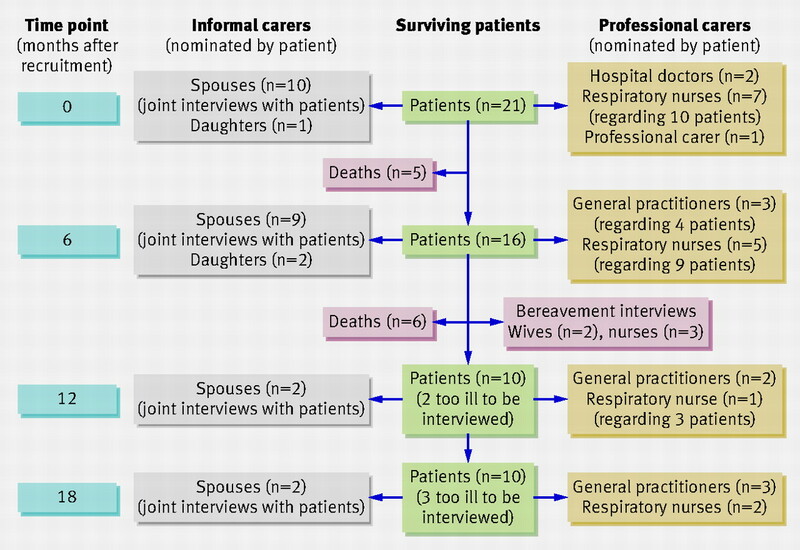 Figure 1⇓ gives details of the 92 interviews—23 of the patient interviews included the informal carer, and seven of the interviews with professional carers related to more than one patient. Table 2⇓ explains our convention for describing the participants. The major physical and social problems faced by the patients and their informal carers, and the considerable difficulties in accessing appropriate health and social care services, were expected findings13 14 15 16 17 and will therefore not be dwelt on in this paper. Rather, we focus on the reasons underpinning why current strategies for extending palliative care services to people living and dying with COPD is proving such a challenge 8 and suggest alternative approaches to the current policy direction. Apparent throughout the patients’ interviews was a sense of “acceptance” in the face of severe disease and social difficulties. COPD was something that had to be coped with “as best you can” [F07.1]. Distressing breathlessness was accepted as “the way it has worked out” [F02.1]. Patients did not actively seek out information about their condition; indeed several patients indicated that they would “rather not know” [F07.1]. For many patients their situation was made considerably worse by unsuitable housing that they seemed powerless to influence, leaving them to “do the best you can with what you’ve got” [F02.1]. Although this passivity might be construed negatively, or as weary resignation to insurmountable problems, in some contexts it could also be seen as representing an appropriate adaptation to a way of life. The only exception was a relatively young patient with α1 antitrypsin deficiency. He and his wife had actively searched for information on the internet, joined a national organisation for people with “Alpha 1,” and campaigned to improve their circumstances. An early observation was the contrast between the chaotic stories told by people with COPD and the well constructed and rehearsed narratives of people with, for example, lung cancer.26 Patients with COPD struggled to tell a coherent illness story distinct from their life story. These data are summarised in table 3⇓. It proved impossible for our participants to identify a “beginning” to their COPD story. Some simply acknowledged that they had “always been bothered” [L03.1] with symptoms that dated back to their “younger years” [T06.1]. Others identified a milestone (for example, point of diagnosis or a severe exacerbation) and used it as a beginning, although it was clear that disabling symptoms had preceded this beginning by many years. A different beginning could be selected in subsequent accounts, demonstrating the fluidity of the stories. Some patients responded with well structured stories of unrelated health problems (“I had a major op in the infirmary . . . They thought I had cancer.” [L04.1]). Others answered the question of “when?” by explaining “how” smoking or their job had caused the symptoms. The insidious onset and lack of clear beginning to the disease was echoed by the clinicians, who described a point of “formal diagnosis of the actual COPD problem” [F10.1 GP] that was preceded by years of an “informal” recognition of the developing symptoms. The exception again was the patient with α1 antitrypsin deficiency, who told a dramatic and well rehearsed story about how the diagnosis was confirmed the day before his wedding. Although he acknowledged that he had been “slowly deteriorating” for many years before diagnosis, the story was told as a sudden disruption to life. Patient L06.1: “So my lungs was away and I was 41. Unlike the narratives of people with cancer and heart failure, where accounts of the period from diagnosis are characterised by a clear sense of a developing plot with one event leading to another,26 the patients with COPD told “chaos narratives” characterised by directionless stories that were typically indistinguishable from their life story and natural ageing. The participants told illness narratives about their exacerbations (for example, being increasingly breathless and rushed into hospital) or a referral for assessment for lung transplantation (such as having high hopes that were dashed after complex assessments at a distant hospital). Exacerbations were described as independent episodes interrupting “normal” life; there was little sense of a linkage, or a developing trajectory. The very slow evolution of COPD meant that some participants who had experienced a long interval between exacerbations were almost able to tell a “restitution narrative.” Table 4⇓ shows a restitution narrative told by a 75 year old man [T01] who was able to describe himself as “well” after several months in which his very severe COPD was relatively stable. This is set against a background of a chaos narrative in which little changes over the 18 month study. Although clinicians were aware of the chronic deteriorating nature of COPD, they told a parallel story of a “way of life” and colluded (at least linguistically) with the idea that the patient was “well” between exacerbations. By contrast, the patient with α1 antitrypsin deficiency and his wife told a classic “quest” narrative. They knew and accepted that the story would end in his death, but were determined to use the intervening time fighting to improve care for him and others with the condition. Patients were aware that their symptoms were severe and appreciated that the future was uncertain, but—consistent with the chaos narrative—“the end” was described in terms reminiscent of a normal expectation of death rather than as an anticipated consequence of an unfolding story. In keeping with findings from surveys of attitudes to death among the public in the United Kingdom,27 our participants were aware of their own mortality (for example, an 85 year old patient commented that she “did not know” whether she would still be alive for future interviews[L05.1]). Death, however, was generally not considered as an imminent threat, and end of life wishes were generally not discussed with professional carers, friends, or family. In telling the story of an exacerbation, several patients said “I thought I was going to die” (in the past tense), but in keeping with the restitution narrative of the acute attack, once they were restored to normal the threat receded. Interestingly, the professional carers sometimes used language that echoed the patients’ normalisation of the prospect of death. Professional carers were aware that patients were deteriorating, but a transition point for palliative care was elusive. The uncertain prognosis (“Is this it? Another year? Three years?” [F09.1 nurse]) was universally cited as a barrier, but there were other more subtle influences of particular relevance in the context of long standing relationships. Some professional carers struggled with moving from “always being able to do something” to acknowledging “for the rest literally what can we do?” [F07.2 nurse]. In contrast to consultations with people with cancer where “I think it seems to come up more naturally to talk about [death]” [L03.1 GP], a familiar and comfortable pattern of consulting prevented initiating an unlooked for discussion about the future. Again, an exception was the patient with α1 antitrypsin deficiency, who was one of only two participants in our study to have discussed the end with his doctors. He and his wife spoke openly from the very beginning of the first interview about his death and their plans for it. When faced with a decision about the use of morphine in a potentially life threatening exacerbation, his wife referred to their plans for future care. Participants in the end of study workshop offered additional explanations for our observation of acceptance of the way of life among patients with COPD and debated the practicalities of providing supportive end of life care in the context of a condition in which it is not possible to identify a time point for transition to the palliative care approach (box 3). The participants in our study described severe symptoms that caused major disruption to normal life, but often in terms implying acceptance of the situation as a way of life rather than an illness. The chaos narratives of their disease stories were impossible to distinguish from their life stories, lacked a clear beginning, and had an unpredictable and unanticipated end. Professional carers’ perspectives echoed this chaos narrative, contributing to the difficulty in defining a point when palliative care might be appropriate. The policy focus on identifying a time point for transition to palliative care has little resonance with these accounts from patients, informal carers, and professional carers, and may be counterproductive if it distracts professional carers from timely consideration of providing much needed supportive care. Passive acceptance, weary resignation, or comfortable adaptation? The social and clinical burden described by our study participants reflects accounts in the current literature.13 14 15 16 17 Some researchers have commented on a sense of “sad resignation”28 and a tendency for people with COPD to “marginalise” their condition as the result of “old age.”29 Delegates at the end of study workshop suggested a range of explanations for this “passive acceptance,” including “stoicism,” “weary resignation” after years of futile attempts to improve their circumstances, “recalibration” analogous to the response shift recognised in quality of life research,30 or an adaptive coping strategy. Habraken et al attributed the “silence” of people with end stage COPD to them considering their limitations as normal and regarding themselves as ill only during acute exacerbations.31 Our data support this interpretation and enable us to offer a theoretically based interpretation. In her seminal book Hard earned lives: accounts of health and illness from East London (1984), Cornwell identifies three categories of health problems: normal illnesses, real illnesses, and health problems that are not illnesses (table 5⇓).32 Although our study participants all recognised the current “reality” of their illness, the lack of story, the causal link with lifestyle, and the lifelong trajectory of the disease suggest that, despite the severity of their symptoms, they classified COPD as a health problem that is not an illness. Symptoms were described as stemming from a lifetime of exposure to fumes, smoking, or both, and breathlessness was considered “part of getting older.” By contrast, exacerbations were often classified as real illnesses, but once the acute episode was over patients felt they were “back to normal.” The only exception was the man with α1 antitrypsin deficiency, in whom a genetic cause, a clear medical diagnosis, a young age, and severe symptoms signified a real illness. The term “biographical disruption” describes the major disruptive experience of developing a chronic illness and the consequent rethinking of a person’s biography and self concept.24 33 34 More recently, the idea of a “biographically anticipated” event35—exemplified by older peoples’ experience of osteoarthritis36 and stroke37—considers that for some people in some circumstances, certain illnesses can be a “normal crisis.” Our findings extend these concepts by showing that in a very slowly progressive condition such as COPD, patients may have no sense of biographical disruption at all. In such individuals there is no illness narrative separate from their life narrative—rather, our study shows that people gradually adjust their sense of self over the years to fit within the limitations imposed by the condition. This lack of disruption may be at the root of the patients’ and carers’ acceptance and passivity, such that they neither demand nor use services. Clinicians, especially those who have a long term relationship with the patient, may share this passive acceptance of the patient’s way of life, contributing to the difficulties in identifying a transition point to palliative care. Cancer has a well publicised “public story” in which death plays a prominent role.38 People with cancer are aware that they have a potentially fatal condition and tell a dual narrative of despair (“I’m going to die”) balanced by hope (“but I might get better”).23 By contrast, COPD is a relatively unknown condition—even the name causes confusion—with no public story to which patients can relate. As such patients often have no expectation of death and no despair, and equally no hope of cure. Our findings raise interesting comparisons with other disease trajectories. COPD has a lifelong trajectory (effectively from the first exposure to cigarette smoke, which may be in utero),39 and the onset of symptoms is so insidious as to be imperceptible. In contrast, despite their chronic nature, most other types of long term organ failure typically have a relatively acute presentation (for example, myocardial infarction may present as heart failure). Another comparator might be patients who have congenital conditions. The concept of “continual biographical revision” has been used to describe how young people with cystic fibrosis attempt to normalise their lives,40 although the genetic cause of this disease and its impact during childhood distinguishes it from COPD. Morbid obesity, which is caused by lifestyle, may be a parallel health problem that is not an illness. The poorly understood disease trajectory of the frail elderly echoes recent understanding of accelerated lung ageing in smokers,41 and the biomedical model of decline in lung function,39 and may resonate best with the disease trajectory of COPD. Our 21 participants may not fully represent the diversity of people with very severe COPD. In particular, none was from an ethnic minority background, although the study cohort encompassed a broad range of demographic, social, clinical, and healthcare backgrounds. All our participants were smokers or ex-smokers, reflecting the profile of COPD in the UK, and it cannot be assumed that their attitudes can be extrapolated to non-smokers. However, the causal link of COPD with lifestyle factors described by our participants encompassed environmental exposure to a broad range of pollutants as well as smoking. Interviewing patients and informal carers together may have resulted in perspectives being modified or withheld; our experienced researcher was aware of this potential problem and could adopt strategies to enable independent voices to be heard.20 We were aware that researchers’ attitudes influence design, data collection, and analysis of qualitative studies, and used our multidisciplinary professional team and lay advisers to ensure balanced interpretation of the data.22 In addition, the comments of the delegates at the end of the study workshop added to our understanding of the emerging themes and their practical and policy implications. Our findings challenge current assumptions about models of care and have two important implications for clinicians and policy makers. Firstly, our findings suggest that, in contrast to other conditions, COPD is perceived as “a way of life” rather than an illness that disrupts life. This may underpin acceptance of and adaptation to increasing disability and major health and social needs, in a lifestyle that has become familiar over many years to patients, informal carers, and professional carers. Recognition by healthcare professionals of the risk of “passive acceptance” may enable services to be developed that actively identify and seek to address needs. We therefore propose linking holistic assessments of supportive and palliative care needs with milestones throughout the patient’s journey. Suitable milestones might be diagnosis, retirement on medical grounds, starting long term oxygen therapy, hospital admission for an exacerbation of COPD, or (from a clinicians’ perspective) a positive answer to the “surprise” question.8 The palliative care approach thus becomes progressively integrated with good care of a lifelong progressive disabling condition, with palliative care specialists available to advise on management of intractable symptoms (especially breathlessness). The historically low profile of COPD and its lack of public story is a further barrier to effective provision of supportive care. Voluntary organisations may choose to champion the disease and communicate a story to aid public understanding of this silent, lifelong, progressively disabling condition. Clinicians may need to use a proactive management strategy in patients with COPD to minimise the risk of suboptimal management associated with patient and carer inertia. We are grateful to Janet Winter, Colette Lamb, and Anne Aitken, who undertook the initial clinical assessments, and to Marie Pitkethly, Colette Fulton, and June McGill, from Scottish Primary Care Research Network, who helped with recruitment. Susan Buckingham provided administrative support, and David Chinn assisted with coordination of the project within the work of the Primary Palliative Care Research Group. We thank the members of the lay advisory group, recruited by Wendy Halley from the local British Lung Foundation Breathe Easy groups, who worked with us throughout the study, and Patrick White, Declan Cawley, and Tony Davison for their perceptive comments on our draft manuscript. Contributors: HP initiated the idea for the study and led development of the protocol, securing of funding, study administration, data analysis, interpretation of results, and writing of the paper. MK undertook all the data collection and analysis. All authors had full access to all the data and were involved in interpretation of the data. HP and MK wrote the initial draft of the paper, to which all the authors contributed. HP and MK are study guarantors. Funding: This study was supported by the Chief Scientist’s Office of the Scottish Government. HP is supported by a primary care research career award from the Chief Scientist’s Office of the Scottish Government. Ethical approval: Ethical approval was provided by the Multicentre Research Ethics Committee for Scotland (B), and governance approval was obtained from NHS Lothian, NHS Tayside and NHS Forth Valley. Informed written consent was obtained from all patients at the beginning of the study and reviewed verbally before each interview. Informal and professional carers identified by the patient were asked independently for their consent to participate. Data sharing: We do not have consent to share data. Mannino DM, Buist AS. Global burden of COPD: risk factors, prevalence, and future trends. Lancet2007;370:765-73. NHS End of Life Care Programme. The gold standards framework. 2010. www.goldstandardsframework.nhs.uk. Centers for Medicare & Medicaid Services. Publication no 02154: a special way of caring for people who are terminally ill. US Department of Health and Human Services, 2008. Department of Health. NHS end of life care strategy: promoting high quality care for all adults at the end of life. Department of Health, 2008. World Health Organization. The solid facts: palliative care. WHO, 2004. Murray SA, Kendall M, Boyd K, Sheikh A. Illness trajectories and palliative care. BMJ2005;330:1007-11. Coventry PA, Grande GE, Richards DA, Todd CJ. Prediction of appropriate timing of palliative care for older adults with non-malignant life-threatening disease: a systematic review. Age Ageing2005;34:218-27. Murray SA, Boyd K, Sheikh A. Palliative care in chronic illness. We need to move from prognostic paralysis to active total care. BMJ 2005;330:611-2. Connors AF, Dawson NV, Thomas C, Harrell F, Desbiens N, Fulkerson WJ, et al. Outcomes following acute exacerbation of chronic obstructive lung disease. The SUPPORT investigators. Am J Respir Crit Care Med1996;154:959-67. Almagro P, Calbo E, de Echagüen AO, Quintana BBS, Heredia JL, Garau J. Mortality after hospitalization for COPD. Chest 2002;121;1441-8. Christakis NA, Escarce JJ. Survival of Medicare patients after enrollment in hospice programs. N Eng J Med1996;335:172-8. Christakis NA, Lamont EB. Extent and determinants of error in doctor’s prognosis in terminally ill patients: prospective cohort study. BMJ2000;320:469-72. Gore JM, Brophy CJ, Greenstone MA. How well do we care for patients with end stage chronic obstructive pulmonary disease (COPD)? A comparison of palliative care and quality of life in COPD and lung cancer. Thorax2000;55:1000-6. Habraken JM, Willems DL, de Kort SJ, Bindels PJE. Health care needs in end-stage COPD: a structured literature review. Pat Ed Counsel2007;68:121-30. Rocker GM, Sinuff T, Horton R, Hernandez P. Advanced chronic obstructive pulmonary disease: innovative approaches to palliation. J Palliat Med 2007;10:783-96. Seamark DA, Seamark CJ, Halpin D. Palliative care in chronic obstructive pulmonary disease: a review for clinicians. J R Soc Med 2007;100:225-33. Lynn J, Ely EW, Zhong Z, McNiff KL, Dawson NV, Connors A, et al. Living and dying with chronic obstructive pulmonary disease. J Am Geriatrics Soc2000;48(suppl 5):S91-100. Department of Health. Consultation on a strategy for services for chronic obstructive pulmonary disease (COPD) in England. Department of Health, 2010. NHS Quality Improvement Scotland. Clinical standards for chronic obstructive pulmonary disease services. NHS Scotland, 2010. Kendall M, Murray SA, Carduff E, Worth A, Harris F, Lloyd A, et al. Use of multiperspective qualitative interviews to understand patients’ and carers’ beliefs, experiences, and needs. BMJ 2009;339:b4122. Murray S, Sheikh A. Serial interviews for patients with progressive diseases. Lancet2006;368:901-2. Malterud K, Qualitative research: standards, challenges and guidelines. Lancet2001;358:483-8. Reissman CK, Narrative analysis. Sage, 1993. Bury M. Chronic illness as biographical disruption. Sociology Health Illness1982;4:167-82. Frank A. The wounded storyteller: body, illness and ethics. University of Chicago Press, 1995. Seymour JE, French J, Richardson E. Dying matters: let’s talk about it. BMJ2010;341:c4860. Elofsson LC, Ohlen J. Meanings of being old and living with chronic obstructive pulmonary disease. Palliat Med2004;18:611-8. Exley C, Field D, Jones L, Stokes T. Palliative care in the community for cancer and end-stage cardiorespiratory disease: the views of patients, lay-carers and health care professionals. Palliat Med2005;19:76-83. Sprangers MA, Schwartz CE. Integrating response shift into health-related quality of life research: a theoretical model. Soc Sci Med1999;48:1507-15. Habraken JM, Pols J, Bindels PJE, Willems DL. The silence of patients with end-stage COPD: a qualitative study. Br J Gen Pract2008;58:844-9. Cornwell J. Hard earned lives: accounts of health and illness from East London. Tavistock, 1984. Charmaz K. Loss of self: a fundamental form of suffering in the chronically ill. Sociology Health Illness1983;5:168-95. Williams G. The genesis of chronic illness: narrative reconstruction. Sociology Health Illness1984;6:175-200. Williams SJ. Chronic illness as biographical disruption or biographical disruption as chronic illness? Reflections on a core concept. Sociology Health Illness2000;22:40-67. Sanders C, Donovan J, Dieppe P. The significance and consequences of having painful and disabled joints in older age: co-existing accounts of normal and disrupted biographies. Sociology Health Illness2002;24:227-53. Pound P, Gompertz P, Ebrahim S. Illness in the context of older age: the case of stroke. Sociology Health Illness1998;20:489-506. Diffen E. Is the ‘Jade effect’ still working? BBC News, 2010 March 22. http://news.bbc.co.uk/1/hi/magazine/8579781.stm. Fletcher C, Peto R. The natural history of chronic airflow obstruction. BMJ1977;1:1645-8. Williams B, Corlett J, Dowell JS, Coyle J, Mukhopadhyay S. “I’ve never not had it so I don’t really know what it’s like not to”: nondifference and biographical disruption among children and young people with cystic fibrosis. Qual Health Res 2009;19:1443. Ito K, Barnes PJ. COPD as a disease of accelerated lung aging. Chest 2009;135:173-80.